The summer holidays are over already and another school year has started. Time for me to get back into something of a routine and begin posting a bit more regularly again. 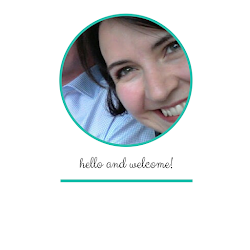 I have to say I'm really looking forward to re-acquainting myself with blog-life again. While I wasn't able to get time to post on my blog at all through the summer holidays, I did challenge myself to post a photo a day over on Instagram, and I succeeded! 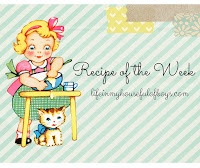 It's made for a lovely sort of micro-blog of our summer. 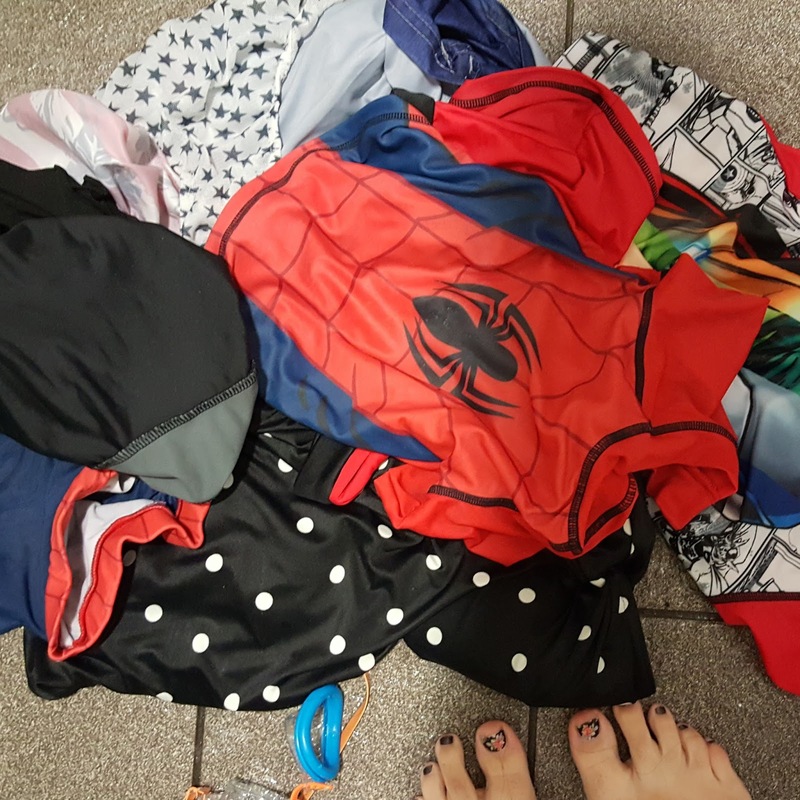 One of the reasons that I keep my blog is as a way of remembering things for myself, I don't want to look back in a few years time and see nothing on here about Summer 2016 and so I'll be posting a recap of our summer this week in a few different posts. Rather than one HUGE post. Starting today by going right back to the start of the holidays and looking at what we did in weeks 1 and 2. With a lot of help from my Instagram photos reminding me, as even though the holidays flew by, the first couple of weeks already seem a long time ago! Day 1 On the first day of the holidays we went for a visit to the Almond Valley Heritage Centre. I used to have a season ticket for it when the older two boys were younger, but we hadn't been for quite a long time. The younger two boys didn't remember being before and they really loved it. 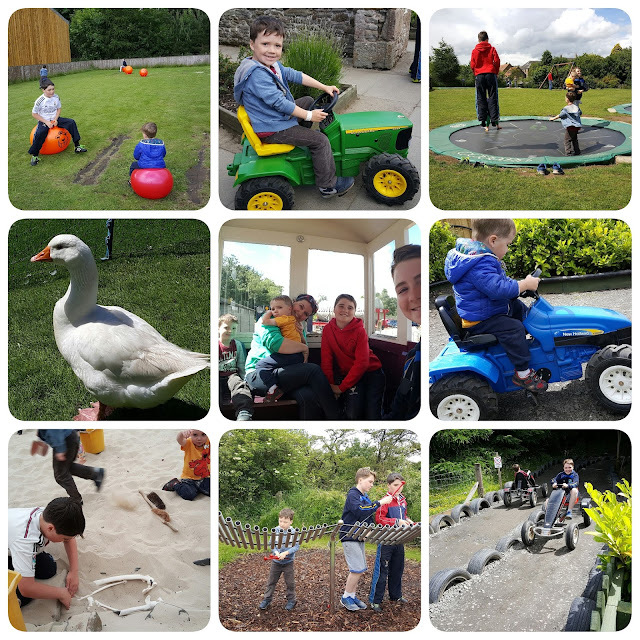 The older boys really enjoyed the day too, despite the occasional heavy rain shower - a sign of how the weather was set to continue for most of the holidays. 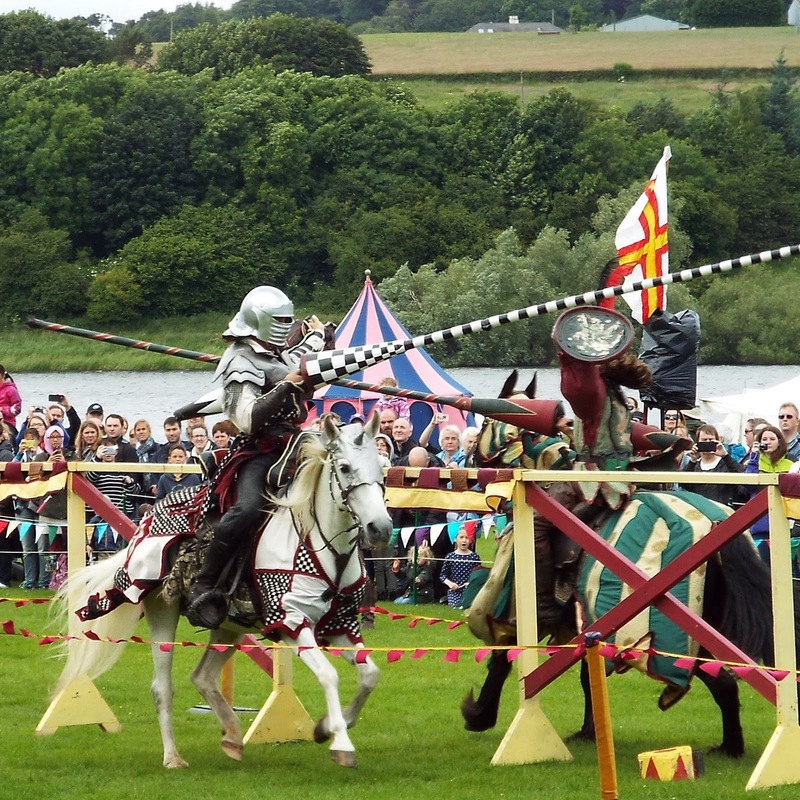 We went along to the annual Historic Scotland Spectacular Jousting event at Linlithgow Palace. We have been to it in the past and it has always been a really great day out. 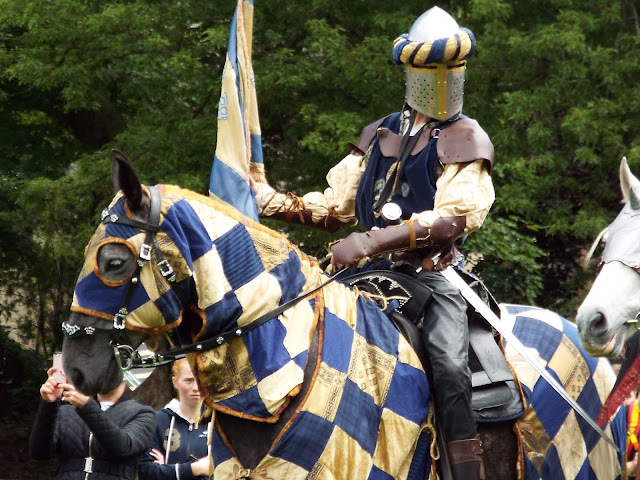 Ally (7) and Fraser (2) were particularly enthralled by the real life knights. We were thankful that the rain held off for the first performance. Not long after it finished, the most torrential rain started and the wind got up too. There followed a mass exodus of families heading home earlier than planned! No rain showers today, rather torrential rain all day. So it was a day of indoors fun for us. 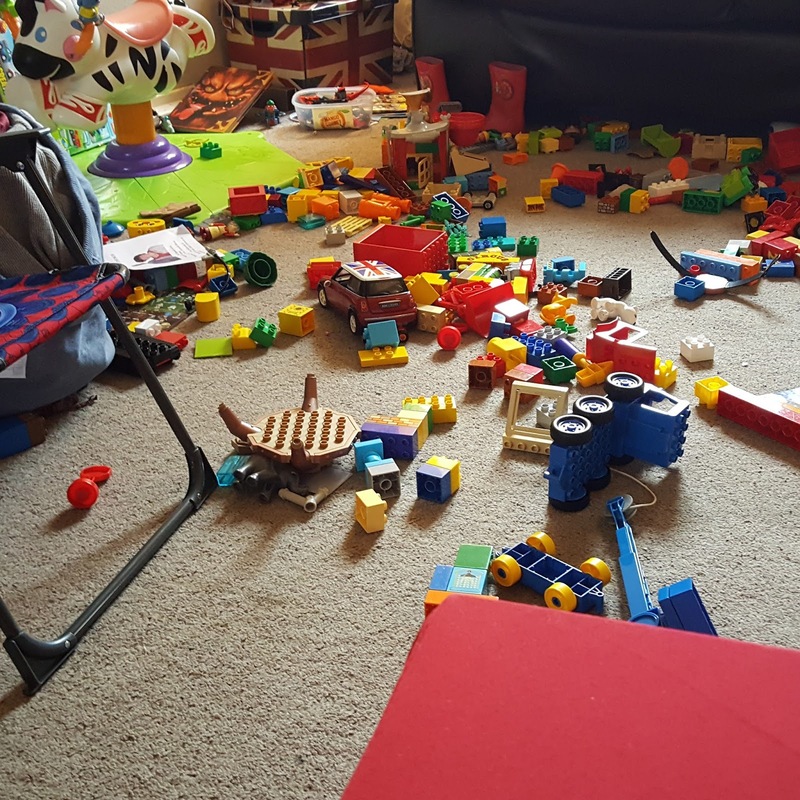 And the house looked a lot like this. All over. It was my mother-in-law's birthday. 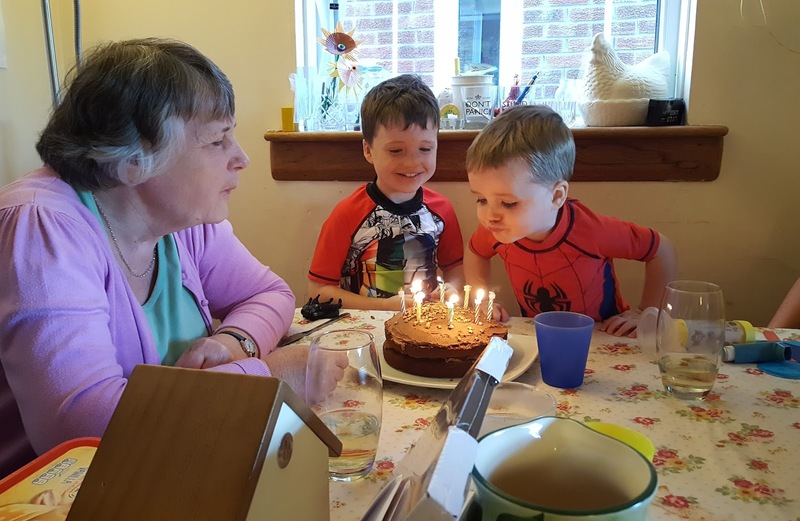 Both she and my father-in-law had come through to ours for dinner that night, so Calum (13) baked Granny a birthday cake. Fraser (2) was delighted to help her blow out the candles. Yet more indoor fun. 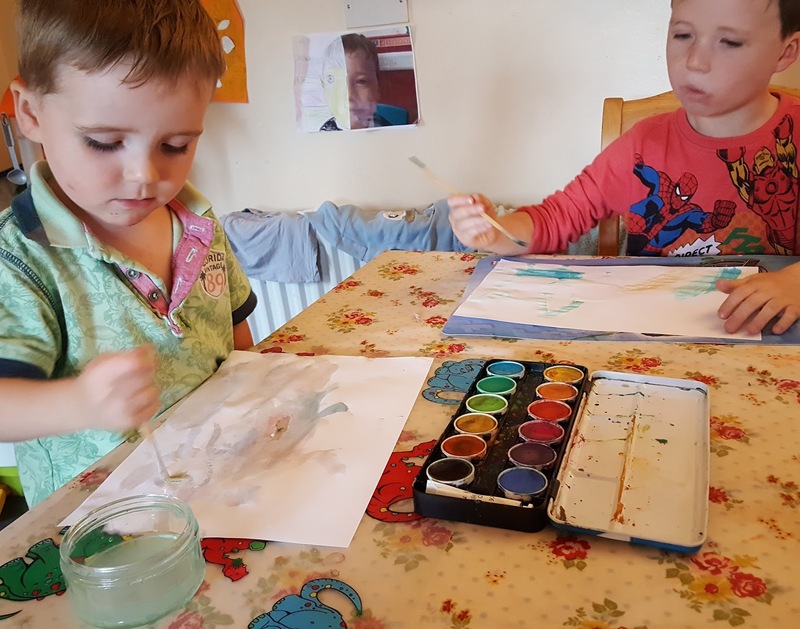 Fraser (2) discovered that he loves to paint with this watercolour set I found at the bottom of our craft box. 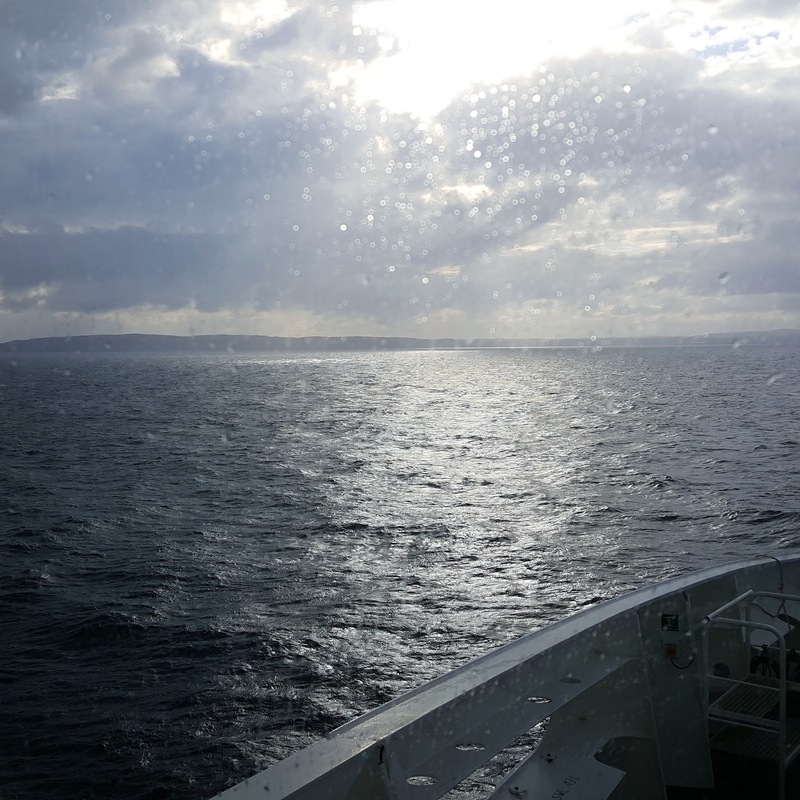 The very welcome sight of Lewis on the horizon. The four youngest boys and I had travelled up to Lewis by train, bus and then ferry. James (16) hadn't come with us as he was heading away for two weeks at Army cadet camp the following day. Dad was due to join us in Lewis a week after we had arrived and then James would join us all there a week after that. 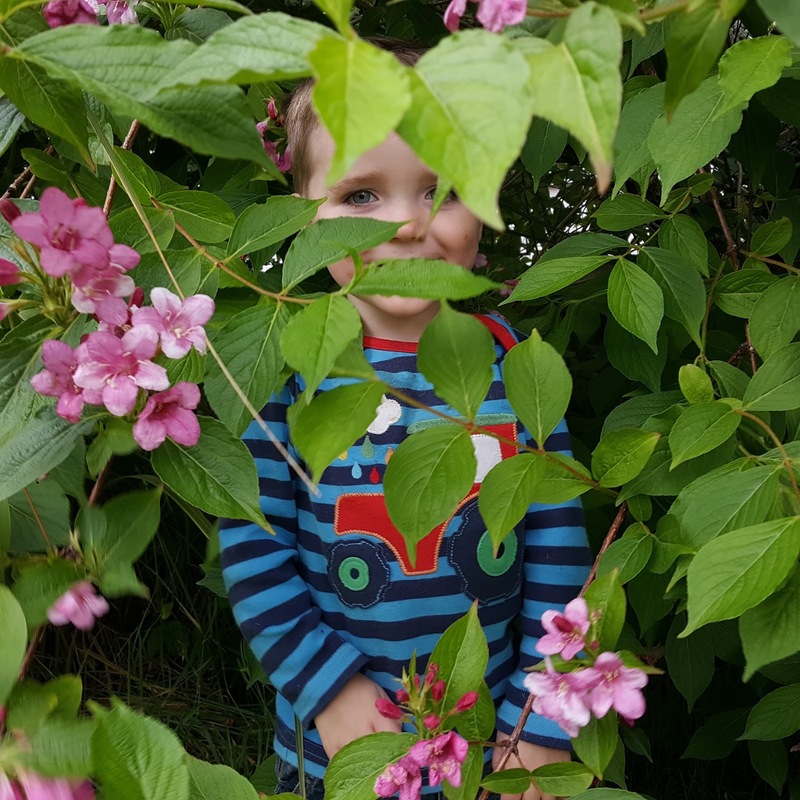 Fraser enjoying one of his favourite games, hide and seek, in Granny and Shen's garden. Weather report? You've guessed it. 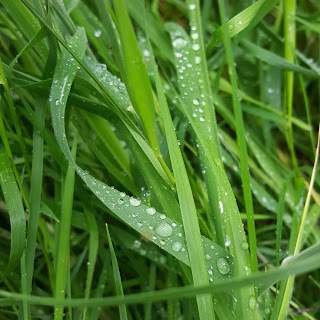 Showery rain. I took out a family membership at the sports centre in Stornoway since we were going to be there for nearly a month. This was the first of many visits to the swimming pool there. A quiet Sunday. 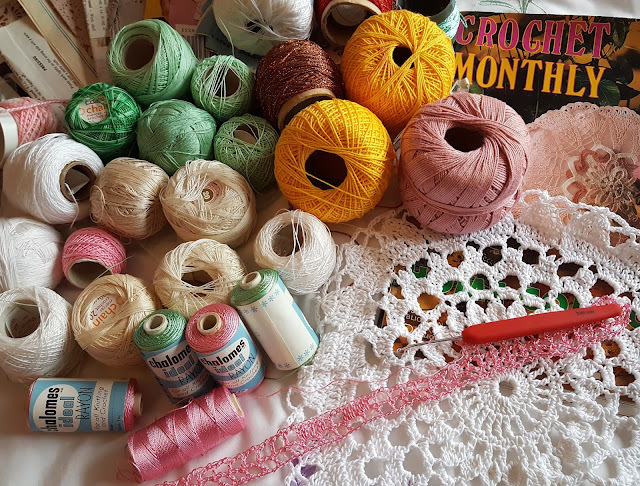 My mum's cousin had given me a bag of old crochet cottons and vintage patterns that belonged to her Aunt. Most of the patterns were for doilies and so I tried my hand at one of them, the white one in the bottom right. It didn't turn out too badly! 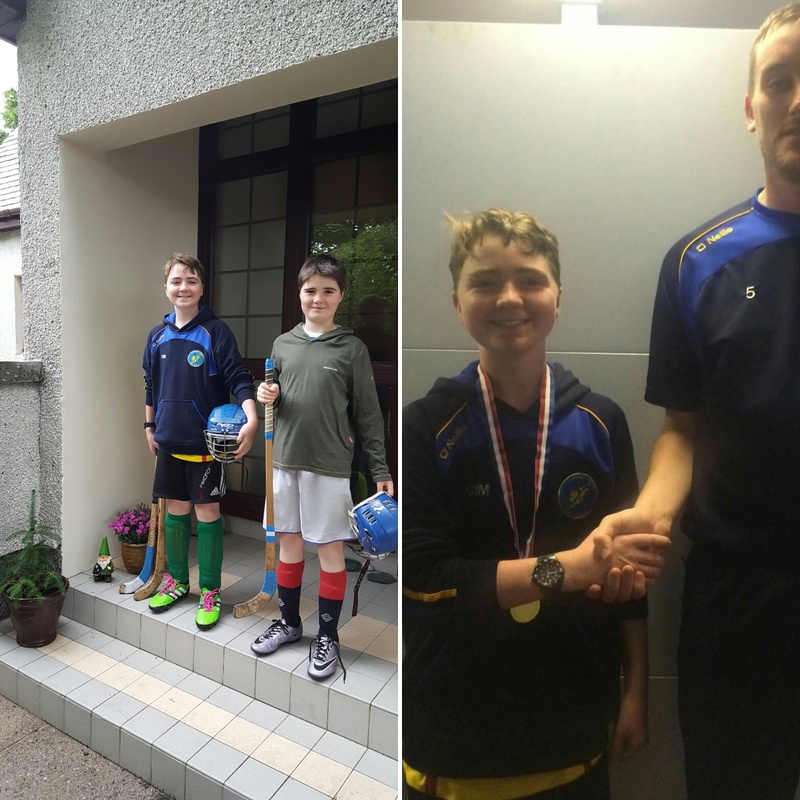 Calum (13) and David (10) spent the morning at shinty training with Camanachd Leodhais. It was the first session of a week long training camp. 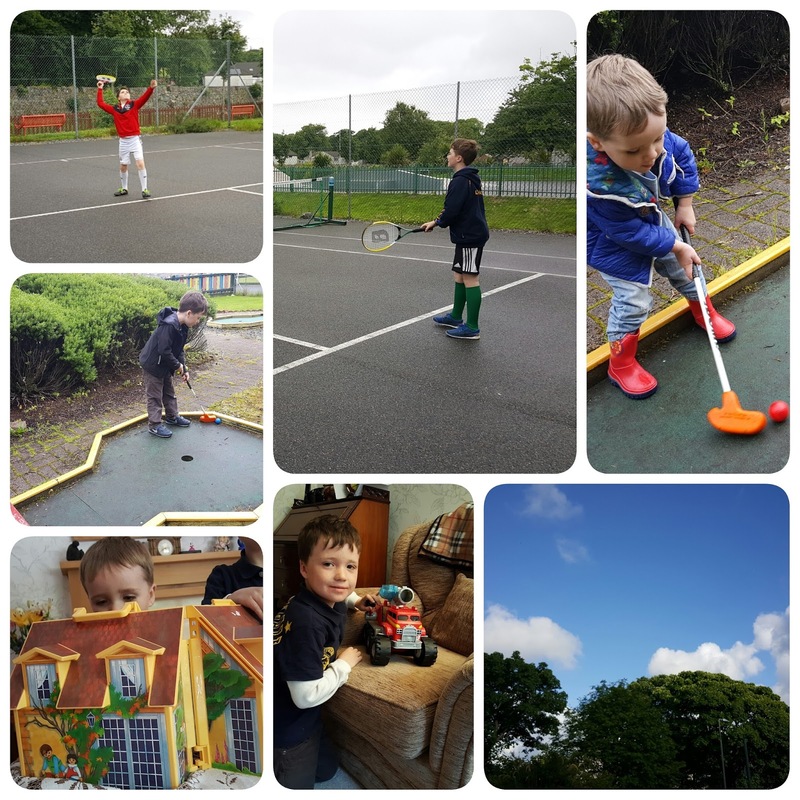 They still managed to have energy for a game of tennis afterwards, while I took the younger two boys for a round of crazy golf. Fraser and Ally got a couple of great bargains at the charity shops, and we also saw our first proper glimpse of blue sky in more than a week! I'm really not a fan of soft plays. In fact I would actually go so far as to say that I hate them! 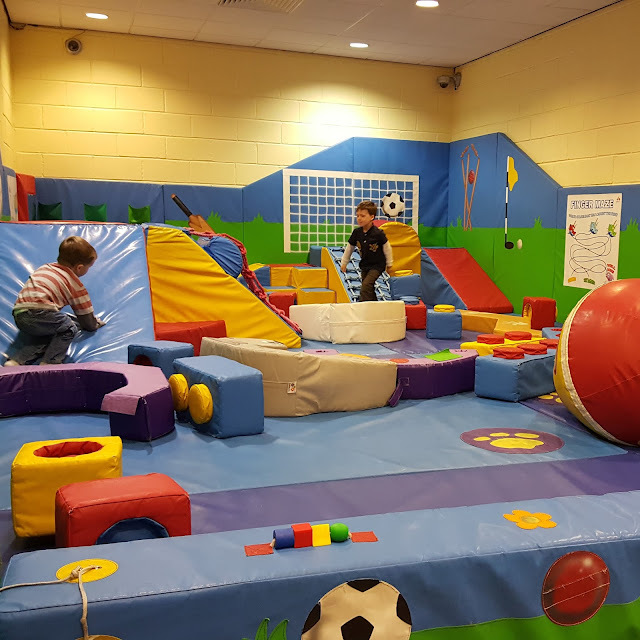 The small one in the Stornoway Sports Centre is the exception to this though, and the younger boys enjoyed a run around it in the morning while the bigger boys were at shinty again. It was even more fun as they had it all to themselves! I had an old friend coming round for cake and a catch-up while the older boys were at shinty. 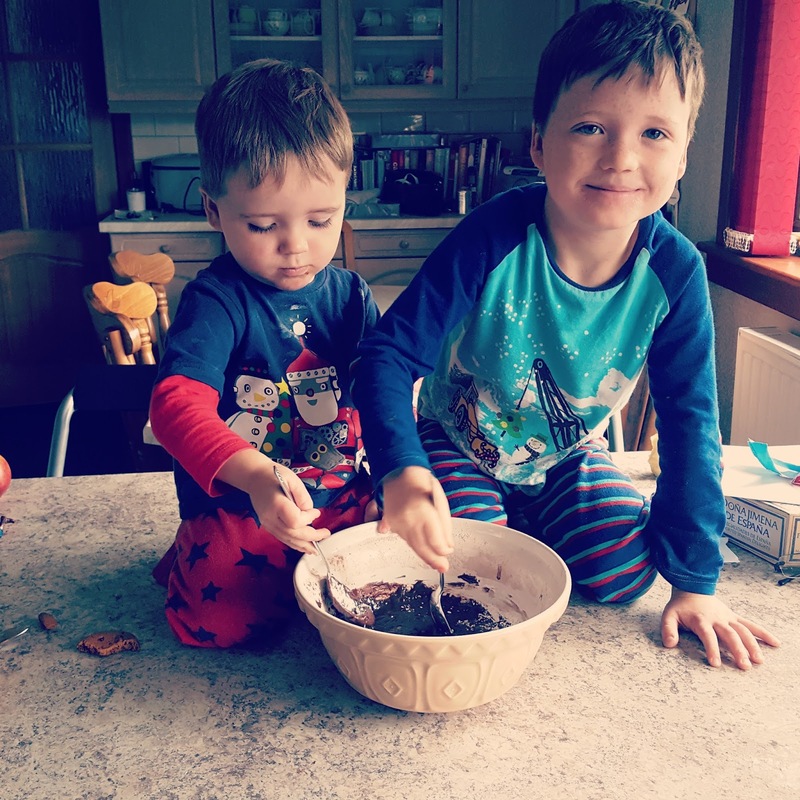 These two were my little assistant cake makers, while still in their jammies. Christmas jammies are not just for Christmas! 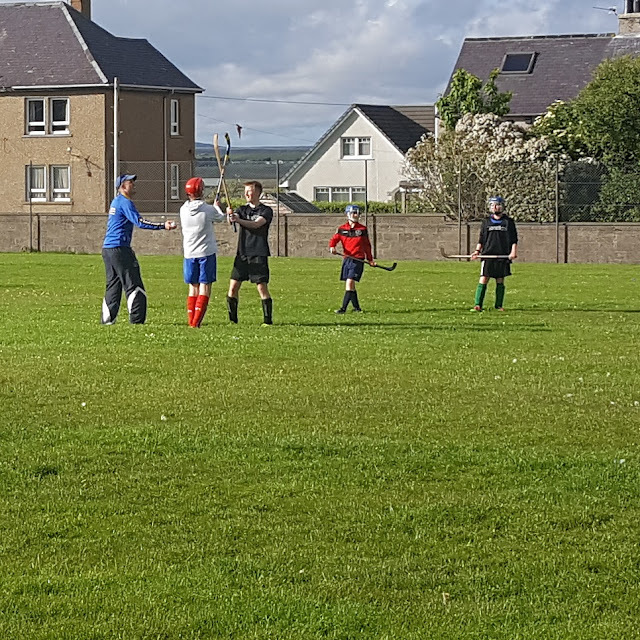 That evening we went along to watch the shinty boys playing in the annual sixes tournament. They played pretty well amongst the adult teams and, more importantly, neither of them ended up with any injuries from over enthusiastic adult players! 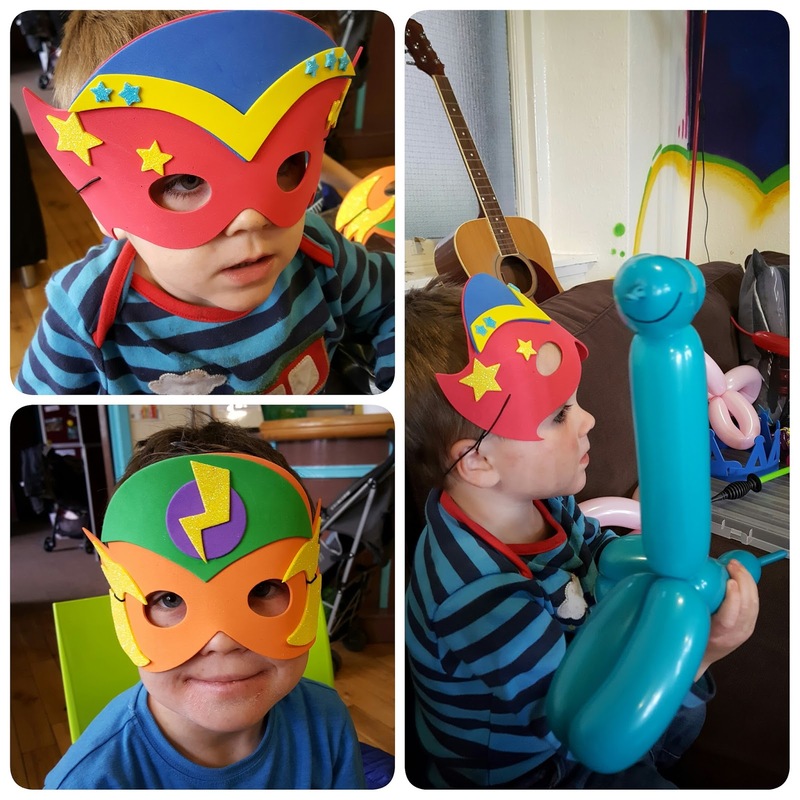 Ally had been looking forward to going along to a family fun session at a local youth club all week, after he had heard there would be a chance to make your own super hero masks! It didn't disappoint him either. The last morning of shinty training. The younger two boys and I had popped into the wool shop to buy some buttons in the morning, and I left with a ball of multicoloured yarn that came with a fuzzy pompom. Ally had seen it and asked if I could make him a hat with it. Don't worry, I did also remember to buy the buttons too! 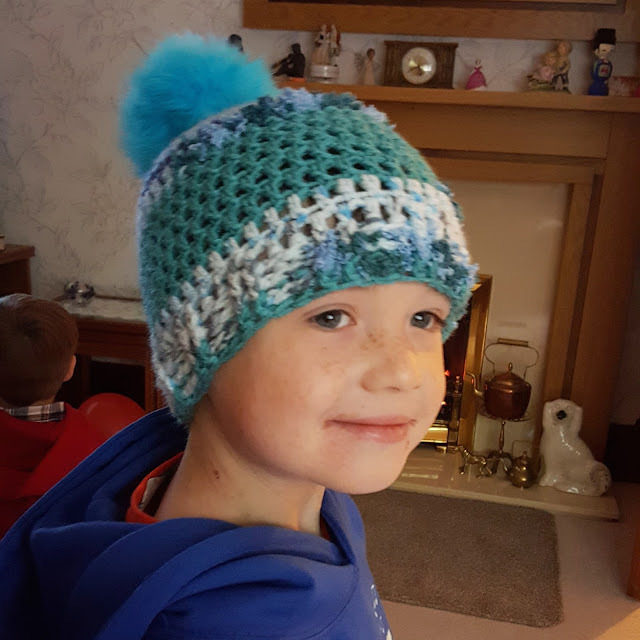 It was such a wet morning that we sat in by the fire, and while Fraser and Ally watched Toy Story - the first time either of them had seen it, but now a favourite of Fraser's - I crocheted Ally his hat. He was rather delighted with the end result. Because the day was so extremely wet, shinty training finished off a little earlier than they had planned. They finished off with a little prize giving and Calum was delighted to come home with the medal for player of the camp. It wasn't just the new hats and medals that made it an exciting day though, but the fact that daddy was due to arrive off the ferry in the evening. The boys kept themselves busy by preparing their entries for the Agricultural Show that was taking place the following day. 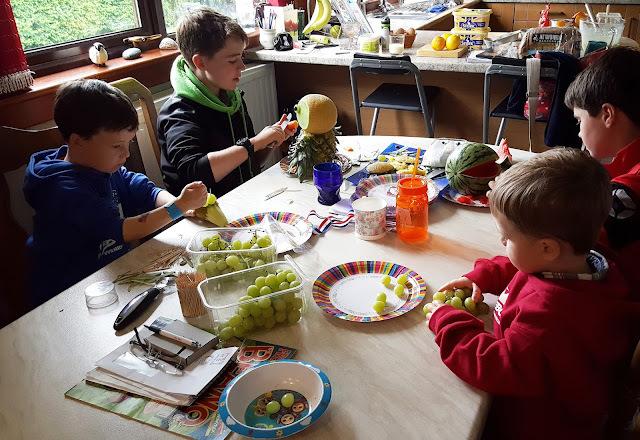 This was them working on their entries for the animal from fruit and vegetable competition. I'll leave their finished animals and their successes at the show for tomorrow's post though, as they are more than worthy of a post all of their own. Welcome to our houseful of boys! I'm Kirsteen, a stay at home mum of our five sons. 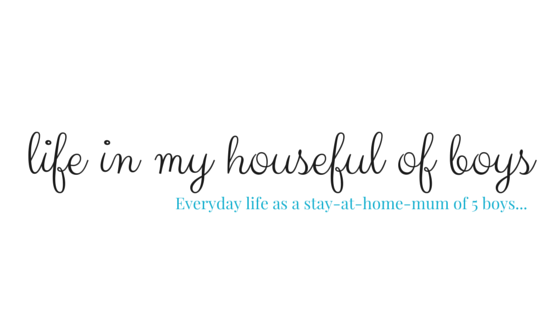 I blog about life in our house, crochet & crafts, baking & recipes, eczema & allergies, keeping Gaelic alive & a whole lot of other stuff. You can read more about us by clicking the image above. All content copyright Kirsteen Murray. Powered by Blogger.